We love massage gadgets and we’re gradually building a collection to pamper to every part of the human body. 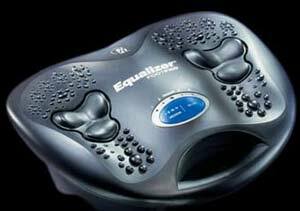 The EQ-400 Ergo Pad device takes care of your aching feet. We’ve seen plenty of foot spas that blow bubbles or jets of warm water over your feet, but this is the first one we’ve come across that really massages them. The Ergo Pad foot massager is contoured to find known acupressure nodes and bring relief after the strains of a long day. The massager features a four speed motor that finds all the sore and stiff areas. There’s even a programming mode for your own tailor-made massage program. The Ergo Pad looks great for people who spend much of their working day standing up. The thing is though, I work at a computer and spend a lot of time sitting down in my job. My feet are fine, but my bum sometimes hurts, so I’m wondering if I can sit on it and get a buttock massage without breaking it! The EQ-400 costs around $120 and is available from The Factory Outlet.